The Hiidenhirven hiihto biathlon is arranged annually by Sommelo. 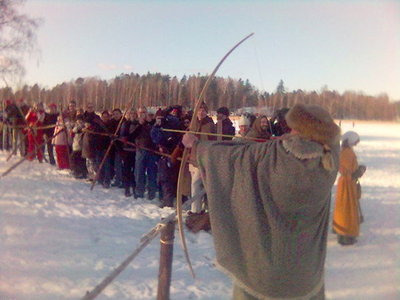 The idea in the race is to ski around Sommelo's Pukkisaari village island with Viking-age equipment, and then try to hit a model elk with two arrows. The competition is arranged as a relay of four-person teams, one which has to be female. I've seen previously the 1999 race, which Harmaasudet won. Since then the competition has gotten tougher. This year's race was especially difficult as the there wasn't enough ice and the competition had to be held inside the island. This year the race was won by Smolensk, Russia based team Viking-Nevo, with last year's winners, the Indian re-enactment club Torahammas finishing second. Harmaasudet were fourth of nine teams, rising two positions from 2004. It was very nice to see the camaraderie between the different historical associations after the game. All were gathered around a bonfire in the reconstructed village swapping stories over traditional Finnish pea soup. After the event we went to Tamminiementien kahvila for some coffee, pastries and chat. Arwen and Kerttu looked definitely out-of-place sitting in their Viking clothes in the 19th century surroundings. I was invited to the Harmaasudet team party, and we spent the evening in Pena's sauna singing, having snow fights and toasts. Unfortunately my camera battery went dead right in the beginning, so all pictures are taken with the relatively crappy phone camera.